Honeybee populations are on the decline due to lack of habitat, monoculture, pesticides and a variety of diseases. After learning about the struggles of honeybees and how important they are to our food supply, we installed two honeybee colonies. Watching them and their complex community is fascinating. Honeybee colonies include a queen, a few hundred drones and about 60,000 worker bees. Inside the hive, honeybees transition through a variety of jobs over their 6 week life cycle. Following are their roles by age. Did you know honey has been harvested for centuries? A honeybee produces 1/12 of a teaspoon of honey over her lifetime. Honey does not go bad. All honey will crystalize and you can liquify it by setting the bottle on a sunny window sill. Honey has been used on wounds as an antiseptic for hundreds of years. Some people claim eating local honey reduces the impact of allergies. This may be due to a gradual exposure to local pollens. Honeybees pollinate many of the foods we eat including cashews, cauliflower, broccoli, peppers, watermelons, oranges, cucumbers, lemons, limes, carrots, strawberries, apples, avocado, cherries, almonds and blueberries. Without these foods, our produce aisle would be bare. Life is not easy for honeybees as they are susceptible to many diseases including varroa miles, colony collapse disorder, American Foul Brood and European Foul Brood disease. Beekeepers lose about 40% of their hives each season. Due to these loses, it is hard to make a profit as a beekeeper. You can help honeybee populations survive by planting flowers which product pollen and nectar, providing shadow water dishes for drinking, and reducing or eliminate pesticide and herbicide use. To get started in beekeeping, you will need bees, protective clothing, hives and a smoker. 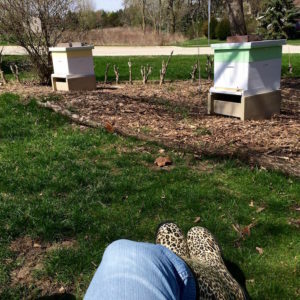 McHenry County honeybee supplies are available from Sue at Harvard Egg and Feed and Warren at Spencer Apiary Supplies. Plants that provide food and nectar for pollinators are beneficial to our environment whether or not you keep honeybees. They not only provide food and habitat for honeybees and other pollinators, they are drought resistant, low maintenance and do not need fertilizers. The Wildflower Preservation and Propagation Committee has native plant yard plans and recommended vendors and offers a mentoring program. Northern Kane County Wild Ones also has a wealth of resources. New and experienced beekeepers can benefit from joining the Northern Illinois Beekeepers Association with meetings most months in Woodstock, Illinois.